My TB called again today!
" Inspection begun. Ok, your turn." Fuzziness but not much shrinkage. Fiber & Burrito Trek Continued. The winding road from Tres Piedras to Tierra Amarilla is really spectacular. There are some gorgeous little folds and valleys tucked back into the canyons. What a great place to retire. A great house, a lot of firewood, lots of fiber projects to do; what a way to spend the winter.Mmm, mmm, mmm. Tierra Wools is actually in Los Ojos. At the junction of the Tres Piedras road and TA road coming from the south [And watch it - it sneaks up fast to a stop sign! ], you turn north and then watch on the left for the turn to Los Ojos. The Wool and Weaving showroom is on the south side of the road just after the little store. It's a big old building with a wonderful space for a showroom for the handwoven rugs and goods. 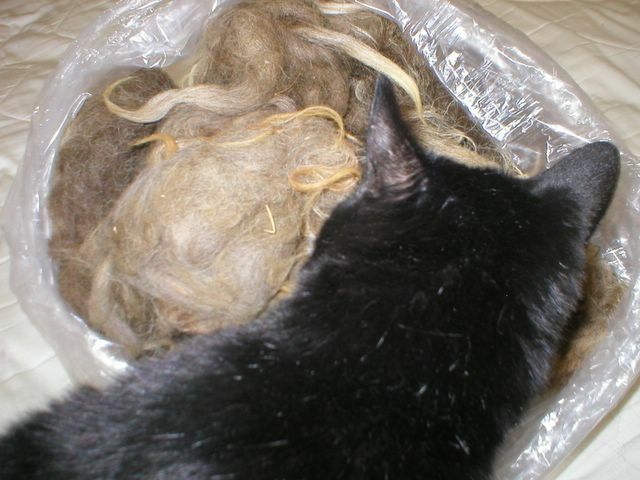 There is yarn, and some roving, and unprocessed wool for sale. I found some leftover yarns in a big basket and bought a bunch for accents in hats or whatever. 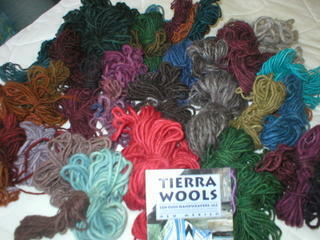 Scrap wool for sale from Tierra Wools in Tierra Amarilla, NM. This shows a range of the colors (not all included here) they can get with natural dyes. In another room in the front of the building is a large spinning wheel and I'm not sure what else. I was focused on the wheel. Olivia showed me how to spin using that wheel. In the back of the building are the other rooms : the one with at least eight looms with several rugs in various stages. Big looms, too. Beyond that are the dye room and washing room. The washing room has a big machine with gears and motors and sluices. It wasn't running, but it'd be fun to see sometime. The dye room had skeins of dyed yarn everywhere and jars of plants and cochineal bugs and black walnuts (I had no Clue what those were!) for making the dyes that they use. It was a really fun place and we were welcome to poke around as long as we liked. It would be fun to go up sometime when all the processes are being demonstrated.I got some raw fleece as well - do I really know what to do with it? NO. Did that stop me?? NO, No, and not a chance!!! This is some raw churro (breed) from Tierra Wools. My "inspectors" took over for a few minutes.More pics below. Ok. 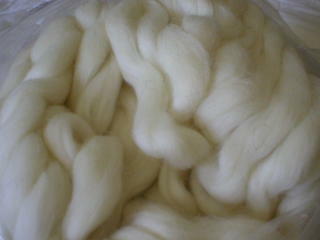 So I also bought some roving that was labelled for felting but it's really beautiful. See? I didn'r realize that you were interested in wools, etc., other than simply knitting with yarn *duh*. Did you ever meet my friend Neila who lived in Placitas? She did weaving on a traditional Navajo loom and she frequently make her own yarn and did her own dying of said yarn because the colors used now are much different from the traditional colors used say 40 years ago or more. She got some yarn from Felix Silva's sheep (remember Felix of Silva's Saloon in Bernalillo?) and made him a small rug of a sheep and the sheep had very long and curly hair and was mode of the wool from his sheep. And it had blue eyes, because everyone was always teasing Felix and accusing him of boinking his sheep. *snicker snort*. Anyway, your recent posts reminded me of Neila and the search for the perfect wool. There is a shop in Madrid that captured the heart of my friend Steve last spring when we were traveling. If you haven't gone up there for a day trip in awhile you may want to. And they may want to buy some of your finished products.